It’s lentils. It’s rice. It’s fried onions. It’s like an onion ring salad but rendered guilt free because…it’s got lentils! And they’re good for you! No wonder it is ancient and “popular throughout the Arab world” (according to the authors) and that there is actually some consensus that it is the ultimate comfort food. And it’s pretty straightforward. 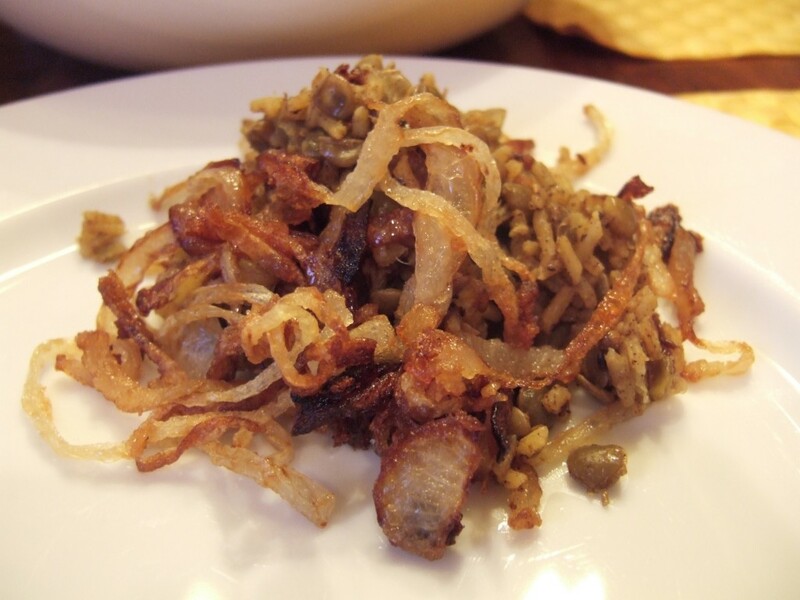 Simmer some lentils, then toss thinly-sliced onions with flour and saute in oil. Next saute basmati rice with cumin and coriander seeds, turmeric, allspice, cinnamon and sugar. Add water and lentils and cook. Then bring it all together for a monochromatic yet impossible to stop eating bowl of yum. It’s the kind of dish that I find myself having one, two, three servings of and still dipping my spoon into as I clean up after dinner. It’s vegetarian and vegan and just crazy good. You will find Mejadra on page 120 of Jerusalem. You can also find the recipe on Serious Eats, in a cute little feature they call “Cook the Book.” Huh. What a coincidence. If I didn’t like them so much I would deploy my team of ruthless copyright lawyers to correct their transparent albeit flattering rip off of my site.